Raife Wilson and his father Andrew (centre) with Nationwide staff durning their visit to the Swindon headquarters. A MELKSHAM charity raising money to fund a life-changing operation for a local four-year old boy, has received a welcome boost of £3,595 from local building society, Nationwide. Raising for Raife is a charity set up by the family and friends of Raife Wilson, who was born with cerebral palsy, a condition which affects movement and co-ordination, making it hard for him to balance. In the summer, Nationwide made it their charity of the year for fundraising. 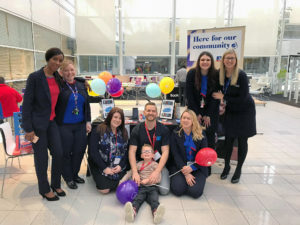 Staff at the Melksham branch, along with their colleagues at branches in Chippenham, Marlborough, Devizes and Swindon, are hoping to raise £25,000 to help pay for selective dorsal rhizotomy (SDR), a special operation that will help Raife walk on his own. Money has been raised in all the branches by hosting cake sales, raffles and a ‘name the teddy’ competition. A total of £45,000 is needed for the operation. With friends and family already having raised £22,000 since late 2016, the money raised by the building society brings the total amount to £25,595. To thank and encourage staff with their fundraising, the Wilson family has been visiting Nationwide branches across the county. Recently the family paid a visit to the Swindon Croft branch, based at the building society’s headquarters. Laura said, “Everybody was so interested in meeting Raife and learning about his journey at the head office. “He was showered with gifts, treated like a VIP and was allowed access to areas that even staff are not allowed into! Customer service manager for the Swindon Croft branch, Debbie Mills said, “It was so overwhelming for everyone meeting Raife and his parents Laura and Andrew. It really helped to show us the difference we are making – it becomes more real.